NEW YORK/TORONTO (Feb. 1, 2019) – This month the National Hockey League Players’ Association (NHLPA) and National Hockey League (NHL®) will celebrate Black History Month. Stories of players and pioneers will be highlighted throughout February with original programming daily online and on social, and specialty programming on NHL Network. The Black History Month celebration is part of Hockey Is For Everyone™, a joint NHL and NHLPA initiative celebrating diversity and inclusion in hockey. 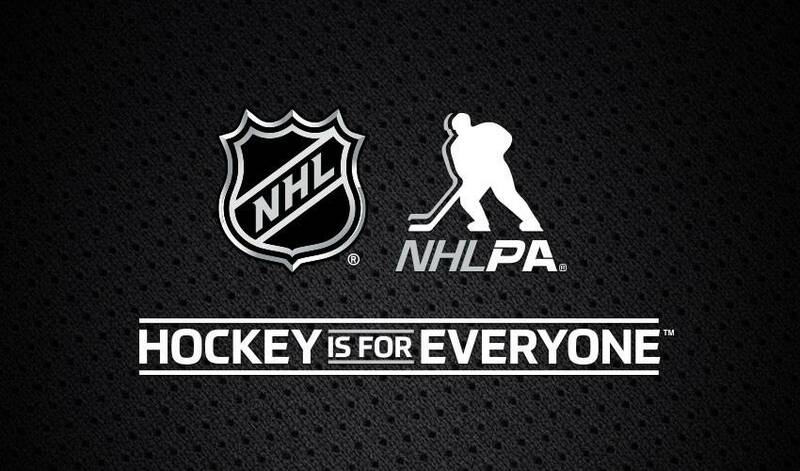 New this season, the Hockey Is For Everyone initiative has expanded from one month to year-round with NHLPA, NHL, Club and player participation. Returning this year, all 31 Member Clubs have named an NHL player as a Hockey Is For Everyone ambassador, pledging to be a leader in the locker room and their community. For the first time this season, the NHL® Presents the American Legacy Black Hockey History Tour, a uniquely curated mobile museum, will visit six U.S. cities in celebration of Black History Month. The 525-square foot museum looks back at the founders, trail blazers, history makers, and Stanley Cup champions; and looks ahead to the next generation of young stars, NHL Officials, broadcasters, and women in the game. The museum will travel to schools, community rinks and NHL arenas, incorporating unique programming at each stop. The calendar of events in partnership with NHL Clubs includes: New York Rangers (Feb. 2); New Jersey Devils (Feb. 5-6); Nashville Predators (Feb. 9-10), Tampa Bay Lightning (Feb. 14-16), 2019 Coors Light NHL Stadium Series™ with the Philadelphia Flyers (Feb. 23-24), and Washington Capitals (Feb. 25-27). For a detailed list of locations and events open to the public, fans can visit NHL.com/BlackHockeyHistory. Original video content scheduled for release this month includes Skates Off player profile pieces featuring Hockey Is For Everyone ambassadors Seth Jones (Columbus Blue Jackets) and Evander Kane (San Jose Sharks), as well as P.K. Subban (Nashville Predators). Also this month, a roundtable discussion hosted by NHL alumnus Anson Carter will air on NHL Network™, featuring in-depth conversations with Hockey Hall of Famers Grant Fuhr, Angela James, and Willie O’Ree discussing racism, breaking down barriers in hockey, and personal stories. On February 22-24, the Ed Snider Youth Hockey Foundation and Philadelphia Flyers will host more than 100 kids and coaches from Hockey Is For Everyone programs across North America for the annual Willie O’Ree Skills Weekend. Since 2010, the weekend has brought together boys and girls from diverse backgrounds to participate in on-ice and off-ice lessons designed to build confidence and teach life skills. This year’s skills weekend will take place alongside festivities for the 2019 Coors Light NHL Stadium Series™ where the Flyers will host the Pittsburgh Penguins. Every youth hockey participant is receiving a special invitation to attend the outdoor game. Future Hockey Is For Everyone initiatives include Gender Equality Month (March), Earth Month (April) and Pride Month (June). Details will be announced at a later date.